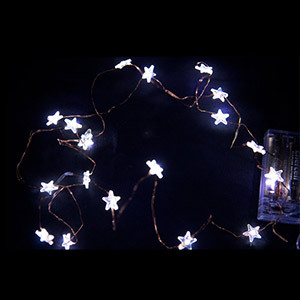 These beautiful White Star String Lights are perfect for decorating. 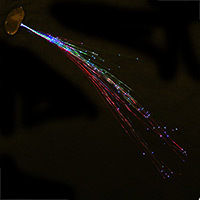 Add them to clothes for festivals and conventions or use them brighten your decor. 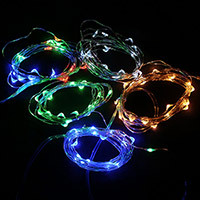 The LED string lights are 76 inches long and have 20 bright white LED stars spaced 3.5 inches apart. The bendy wire thread makes it easy to place each light exactly where you want. The stars light up in a steady white light. White LED Star String Lights are battery-powered and portable. Uses 3 replaceable AA batteries.